There are dozens more scriptures of God’s faithfulness to His people. One of the most significant aspects of God’s faithfulness is his forgiveness of our sins. The Lord seeks for our repentance and desire to draw near to Him. He provides us a way to seek and draw near, and to receive forgiveness. The promise of the coming Messiah is found within His faithful promise was to send a redeemer, Yeshua, to make atonement for our sins where the Lord God in heaven is faithful to forgive if we believe in Yeshua and repent of our sins. The faithfulness of God is such that anyone who seeks Him will find Him. Both faith and faithfulness are a gift. As we apply our faith, being faithful, we begin to realize more and more God’s faithfulness to us. Note that it is the Lord working in our lives to bear the fruit of the Spirit. If we are not bearing His testimonies according to the Torah, we should ask ourselves whether we truly believe what we say that we believe? In 1 John 1:9 we are told, “If we confess our sins, he is faithful and just and will forgive us our sins and purify us from all unrighteousness.” Based upon these words, we have confidence The Lord God will forgive us and deliver us from our enemies just as David believes with confidence the Lord will forgive and deliver him. David speaks of what the enemy is doing saying, ג כִּי רָדַף אוֹיֵב | נַפְשִׁי דִּכָּא לָאָרֶץ חַיָּתִי הוֹשִׁיבַנִי בְמַחֲשַׁכִּים כְּמֵתֵי עוֹלָם: ד וַתִּתְעַטֵּף עָלַי רוּחִי בְּתוֹכִי יִשְׁתּוֹמֵם לִבִּי: ה זָכַרְתִּי יָמִים | מִקֶּדֶם הָגִיתִי בְכָל-פָּעֳלֶךָ בְּמַעֲשֵֹה יָדֶיךָ אֲשֹוֹחֵחַ: 143:3 For the enemy has persecuted my soul; He has crushed my life to the ground; He has made me dwell in dark places, like those who have long been dead. 143:4 Therefore my spirit is overwhelmed within me; My heart is appalled within me. 143:5 I remember the days of old; I meditate on all Your doings; I muse on the work of Your hands. (NASB) Our memory is vital in our relying upon and trusting in the Lord. If we are not in the word of God on a daily basis, we will not be able to discern between what is right and what is wrong (righteousness vs. unrighteousness). David said that because his enemy crushes his life, his spirit is overwhelmed. In today’s world, to be overwhelmed may be the result of taking on too much work or responsibilities that lead to being out of control. Another aspect of becoming overwhelmed may be due to illness or trauma. One may also feel there is too much to do and too little time to do it because of our job, school, time needing to be spent with friends and family, etc. In the Scriptures, when Yeshua felt overwhelmed, he often went away by Himself to get away from the crowds (Mark 1:35) and at other times he went away with his disciples. There were also times when he was so busy they didn’t even have time to eat. Yeshua said to his disciples, “Come with me by yourselves to a quiet place and get some rest.” (Mark 6:31). Yeshua drew away from the crowds in order to draw near to the Lord in heaven. At Gethsemane, Yeshua felt overwhelmed in spirit and soul as it says “He began to be deeply distressed and troubled. My soul is overwhelmed with sorrow to the point of death.” Yeshua said to his disciples “Stay here and keep watch” going a little farther, he fell to the ground and prayed. (Mark 14:33-35). David also dealt with the feeling of being overwhelmed. David’s model for overcoming this was prayer and then remembering the past goodness of God and even during prayer he recalled the goodness of God and His promises. Yeshua did the same, he prayed, and solicited the help of friends to pray for him and for support and encouragement. The Lord is faithful to hear and to take action to help us. When we feel overwhelmed, we pray for peace. David said, “God is our refuge and strength, an ever-present help in trouble. Therefore we will not fear, though the earth give way and the mountains fall into the heart of the sea.” (Tehillim / Psalm 46:1-2) Our God is the God of peace (see Romans 15:33 and 1 Corinthians 14:33). His peace we can ask for at any time having faith that He will answer our prayer. The Scriptures speak of the Lord giving us good things (Matthew 7:11) and is why David remembers the Lord and His deeds in the Psalm, ה זָכַרְתִּי יָמִים | מִקֶּדֶם הָגִיתִי בְכָל-פָּעֳלֶךָ בְּמַעֲשֵֹה יָדֶיךָ אֲשֹוֹחֵחַ: 143:5 I remember the days of old; I meditate on all Your doings; I muse on the work of Your hands. (NASB) David remembers and strengthens his faith by the Scriptures. Return, L·rd, until when? And have console Your servant. Gratify us in the morning with your kindness and we will sing and rejoice in all our days. Let us rejoice like the days of our suffering – the years bad. Show Your servant Your deeds, and return it upon their children. And may the Grace of the L·rd, our G·d be upon us and the work of our hands- guide for us and our handiwork guide it. He who sits in the shelter of the Supreme One, in the Shadow of the L·rd will he dwell. I say to the L·rd “You are my refuge & my fortress my L·rd, I will trust in Him” For He will save you from the ensnared trap from destructive pestilence. With his pinion will he cover you, & under His wings you will be protected. Shield & Armor are His truth. You shall not fear from terror of night, [nor] from the arrow that flies by day. From pestilence that stalks in the dark, from a destroyer that ravages at noon. A thousand will encamp at your [left] side & ten-thousand by your right & to you they will not come near. Only with your eyes you shall peer, & the retribution of the wicked you shall see. Because [you said] “You, L·rd are my refuge” you made the Supreme G·d your abode. No evil shall befall you & a plague will not arrive to your tent. For His angels He will command for you, to protect you in all your ways. On palms they will carry you, lest you stub your foot on a stone. Upon a lion & a serpent you shall tread, you will trample a young lion & a snake. Because he desired My Name – I will protect him & I will lift him – for he knows My Name. He will call Me & I will answer him – I am with him in distress & I will release him & Honor him I will satiate him with longevity of days & I will demonstrate to him My salvation. Even on this very subject do the righteous and the prophets supplicate and pray that the Lord may help them to discover the truth. As David said: “Teach me Thy way, O Lord, that I may walk in Thy truth” (Ps. 86.11), as if saying: “let not my sins withhold the way of truth, by which I may discover Thy way, and the Oneness of thy Name”. Likewise, this Verse: “Restore unto me the joy of Thy salvation, and let a free spirit uphold me” (Ibid. 51.14), is as if saying: “Grant leave to my spirit to do Thy will, and let not my sins be a cause to withhold repentance from me; but let the power be in my hand until I will turn, and understand and know the true way”. And, in such way all other like verses are interpreted. Tehillim / Psalm 143 concludes saying, ט הַצִּילֵנִי מֵאֹיְבַי | יְהֹוָה אֵלֶיךָ כִסִּתִי: י לַמְּדֵנִי | לַעֲשֹוֹת רְצוֹנֶךָ כִּי-אַתָּה אֱלוֹהָי רוּחֲךָ טוֹבָה תַּנְחֵנִי בְּאֶרֶץ מִישׁוֹר: יא לְמַעַן-שִׁמְךָ יְהֹוָה תְּחַיֵּנִי בְּצִדְקָתְךָ | תוֹצִיא מִצָּרָה נַפְשִׁי: יב וּבְחַסְדְּךָ תַּצְמִית אֹיְבָי וְהַאֲבַדְתָּ כָּל-צֹרֲרֵי נַפְשִׁי כִּי אֲנִי עַבְדֶּךָ: 143:9 Deliver me, O Lord, from my enemies; I take refuge in You. 143:10 Teach me to do Your will, For You are my God; Let Your good Spirit lead me on level ground. 143:11 For the sake of Your name, O Lord, revive me. In Your righteousness bring my soul out of trouble. 143:12 And in Your lovingkindness, cut off my enemies And destroy all those who afflict my soul, For I am Your servant. (NASB) David speaks of the Lord working to the effect of His mercy/grace (וּבְחַסְדְּךָ) and His righteousness that saves to deliver us. The Apostle Paul wrote in 1 Corinthians 4:20 For the kingdom of God does not consist in words but in power. (NASB) When Paul wrote of the kingdom of God, he spoke of something more than simple speech. Like David who sought the Lord to deliver him from his enemies, the kingdom of God is in power and being empowered by the spirit of God to overcome sin. In Ephesians, Paul wrote, “And do not get drunk with wine, for that is debauchery, but be filled with the Spirit, addressing one another in psalms and hymns and spiritual songs, singing and making melody to the Lord with your heart, giving thanks always and for everything to God the Father in the name of our Lord Jesus Christ.” (Ephesians 5:18-20) Paul is saying, don’t be intoxicated with alcohol, but be intoxicated with God! His words confront each of us with the question, “Are you intoxicated with God?” What Paul is describing here is that our hearts are to be so overflowing with love for God that our heart, whether light or heavy, can’t help but sing, both to God and to one another? No matter what our circumstances, we are overflowing with thanks to God! David says, יא לְמַעַן-שִׁמְךָ יְהֹוָה תְּחַיֵּנִי בְּצִדְקָתְךָ | תוֹצִיא מִצָּרָה נַפְשִׁי: 143:11 For the sake of Your name, O Lord, revive me. In Your righteousness bring my soul out of trouble. (NASB) One of the reasons why David, who was faithful to God, could be as successful at all that he did was because of his faithfulness, for example David was able to win all his battles because he trusted in God and allowed Him to be his guide. Paul wrote to the Romans saying, “For as many as are led by the Spirit of God, these are sons of God.” (Romans 8:14) Paul says the sons of God are led by the Holy Spirit of God in this life. David believed the same thing saying, י לַמְּדֵנִי | לַעֲשֹוֹת רְצוֹנֶךָ כִּי-אַתָּה אֱלוֹהָי רוּחֲךָ טוֹבָה תַּנְחֵנִי בְּאֶרֶץ מִישׁוֹר: 143:10 Teach me to do Your will, For You are my God; Let Your good Spirit lead me on level ground. (NASB) Each of us can be successful as David was and live a fulfilling life if we allow the Lord God Almighty and His Messiah to be our guide, as David seeks for the Lord to guide him on level ground by God’s Spirit. Why should we allow the Lord God to direct our steps? Because we do not always do what is right where our actions lead to sin. Jeremiah said “it is not for them to direct their steps” (Jeremiah 10:23) indicating that when left to our own we seek to do our own thing and miserably fail. However, when we seek the direction of God in His Torah, we are always blessed. We experience less problems, less sadness, less headache and more joy and peace coupled to God’s blessings and approval. Let’s Pray! 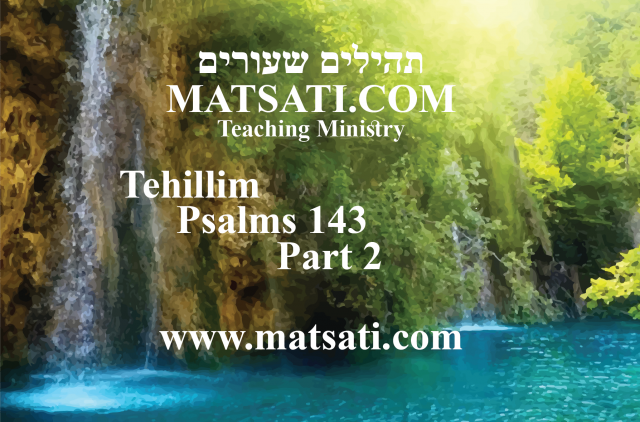 The Rabbinic Commentary (Midrash) on Tehillim / Psalms 143 has 2 parts. Reading through the Midrash we will be looking at Part 1 and 2. Let’s begin by outlining Midrash Tehillim Chapter 143, Part 1 and 2. The משל (mashal) “the parable,” goes on to explain the פתיחתא (Petihta), the rabbis discuss David seeking the Lord to deliver him in his prayer to Solomon, a king who sits enthroned to judge should do so in righteousness and truth! The נמשל (Nimshal) “expansion on the parable” expands upon the משל (mashal), the rabbis consider the day of the Lord when He returns and who will be able to stand. The משל (mashal) “the parable,” goes on to explain the פתיחתא (Petihta), the rabbis discuss how we are stricken with persecution by our enemies. The נמשל (Nimshal) “expansion on the parable” expands upon the משל (mashal), the explanation the Lord has all of these things in His hand and what happens is within the will of God. א מזמור לדוד ה׳ שמע תפלתי האזינה אל תחנוני וגו׳ ואל תבוא במשפט את עבדך כי לא יצדק לפניך כל חי. אמר שלמה מלך יושב על כסא דין מזרה בעיניו כל רע, מי יאמר זכיתי לבי וגו׳ (משלי כ ח ט), מי יוכל לומר ביום הדין זך אני מעוני אין אדם יכול לעמוד, וכה״א ומי מכלכל את יום בואו ומי העומד בהראותו (מלאכי ג ב), מי יוכל לעמוד ביום הדין, וכן ירמיהו אומר שאלו נא וראו אם יולד זכר מדוע ראיתי כל גבר ידיו על חלציו [כיולדה] ונהפכו כל פנים לירקון (ירמיה ל ו) אין אדם ביום ההוא שפניו יפות, אלא ונהפכו כל פנים לירקון , אף אברהם על ישמעאל, אף יצחק על עשו, ואף למעלן על ישראל בשבילן, שנאמר ונהפכו כל פנים לירקון (שם ירמיהו ל׳), אמר ליה דוד בבקשה ממך הרי אני מתפלל לפניך שתענה אותי, ותעשה עמי צדקה על אותו היום, לכך נאמר ה׳ שמע תפלתי וגו׳, אם אין אתה עושה צדקה עמי, מי יוכל לעמוד, וכן איוב אמר מי יתן בשאול תצפנני (איוב יד יג), א״ל הקב״ה לעולם, א״ל עד שיעבור הדין עד יעבור זעם עד שיעבור אף עד שוב אפך, וכן דוד אומר ואל תבוא במשפט את עבדך וגו׳, אמר דוד לפני הקב״ה לדין אתה מכניס אותי, יש עבד נכנס לדין עם קונו, וכן אמר הכתוב אם רשעתי אללי לי וגו׳ (שם איוב י טו), למה הכל לך עבד, וכל אשר לו לקונו וכה״א אך שתים אל תעש עמדי וגו׳ כפך מעלי הרחק וגו׳ (שם איוב יג כ כא), זכר נא כי כחומר עשיתני וגו׳, עור ובשר וגו׳, חיים וחסד עשית וגו׳ (שם איוב י ט יא יב), ועל כל אלה מעמידני לדין, למה, אדם ילוד אשה [וגו׳] כציץ יצא וגו׳, אף על זה פקחת עיניך ואותי תביא במשפט עמך (שם איוב יד א ב ג) לכך נאמר מי יאמר זכיתי לבי וגו׳ (משלי כ ט), אין אדם יכול לזכות את עצמו בדין, למה, כי יחטאו לך כי אין אדם אשר לא יחטא (מ״א מלכים א׳ ח מו), וכה״א כי אדם אין צדיק בארץ אשר יעשה טוב ולא יחטא (קהלת ז כ), ושמים לא זכו בעיניו וכוכבים לא זכו בעיניו לכך נאמר כי לא יצדק לפניך כל חי, מהו כל חי, כל חי לא יצדק לפניך, הא המתים זכים, אלא אף החיות של מעלן אינן יכולין להיצדק לפניך ביום הדין, לכך נאמר כי לא יצדק לפניך כל חי. 1. A Psalm of David. O Lord, hear my prayer, give ear to my supplications; in Your faithfulness answer me, and in Your righteousness. And enter not into judgment with Your servant; for in Your sight will no man living be justified (Tehillim / Psalms 143:1-2). Solomon said, A king that sits on the throne of judgment scatters away all evil with His eyes. Who can say, I have made my heart clean, I am pure from my sin? (Mishley / Proverbs 20:8-9). On the day of judgment can any man say, I am pure from my sin? No man will be able to stand firm. Thus, Scripture says, The Lord will suddenly come to His Temple but who may abide in the day of His coming? And who will stand when He appears (Malachi 3:2) that is, who will be able to stand firm on the day of judgment? As Jeremiah said, Thus says the Lord, We have heard a voice of trembling, of fear, and not of peace. Ask you now, and see whether a man does travail with child; wherefore do I see every man with his hands on his loins, as a woman in travail, and all faces will be turned into paleness? (Jeremiah 30:6), On the day of judgment there will be no man with serene face. Every face will turn pale, even Abraham’s because of Ishmael; even Isaac’s because of Esau; and even the heavenly hosts, because of Israel, for it is said, All faces will be turned into paleness. Accordingly, David said to God, Because of the day of judgment I entreat You. Behold, I beseech You to answer me and show mercy to me. Hence, he said, Hear my prayer, give ear to my supplications (Tehillim / Psalms 143:1). If You show no mercy to me, how can one stand firm? So when Job prayed, Oh that You would hide me in the nether-world (Job 14:13), the Holy One blessed be He, asked, Forever? Job replied, Until judgment will have passed, until indignation will have passed, until wrath will have passed, Until Your wrath be past. Similarly, David said, Enter not into judgment with Your servant; for in Your sight will no man living be justified (Tehillim / Psalms 143:2), that is, David was asking the Holy One blessed be He, Will You bring me to enter into judgment with You? How is a servant to enter into judgment with his master? Similarly, Scripture says if I be righteous, yet will I not lift up my head (Job 10:15). Why not? Because every man is a servant to You, and everything he owns belongs to his Master. Again Scripture says, Only do not two things unto me, then will I hide myself from You, withdraw Your hand far from me; and let not Your terror make ma afraid (Job 13:20-21), and also says, Remember, I beseech You, that You have fashioned me as clay; and wilt You bring me into dust again? Have You not poured me out as milk, and curdled me like cheese? You have clothed me with skin and flesh, and knit me together with bones and sinews. You have granted me life and favor, and Your providence have preserved my spirit (Job 10:9-12). And withal, will You summon me to stand for judgment? Why? Since man that is born of a woman is of few days, and full of trouble. He comes forth like a flower, and withers; he flees also as a shadow, and continues not. And do You open Your eyes upon such a one, and bring me into judgment with You (Job 14:1-3). As Solomon said, Who can say, I have made my heart clean, I am pure from sin (Mishley / Proverbs 20:9). On the day of judgment no man can declare himself pure, because There is no man that sins not (1 Kings 8:46), and because There is not a righteous man upon the earth, that does good, and sins not (Ecclesiastes 7:20). In the sight of God, not even the stars are pure, for it is said, In Your sight no living thing will be justified (Tehillim / Psalms 143:2). What is meant by the words, no living thing? That in Your sight no thing alive will be justified and that only the dead will be adjudged pure? No, the words mean that on the day of judgment even the living things of heaven will be unable to justify themselves in Your sight. Hence, it is said, For in Your sight no living thing will be justified. The rabbis respond saying, “On the day of judgment can any man say, I am pure from my sin? No man will be able to stand firm. Thus, Scripture says, The Lord will suddenly come to His Temple but who may abide in the day of His coming? And who will stand when He appears (Malachi 3:2) that is, who will be able to stand firm on the day of judgment?” We read about the coming judgment of God, that great day of the Lord we will all stand before Him. When we consider the Scriptures, both the Tanach and the Apostolic Writings speak of this day. Based upon the doctrines we are taught today, the difficult question is do most people even know the Creator God, the God of heaven and earth? This comes down to the individual’s spiritual level, where people must deal with God, His Messiah, His Word, and their lives personally which boils down to the level of their own souls and being accountable before God. I have heard the hypergrace teachers say none of these things matter, since Christ died for all the world, one does not need to believe in God or the Messiah, all will go to heaven. This is clearly in error based upon the Word of God. For example, David said to stand firm in God’s Word in the midst of evil (Tehillim / Psalm 37:1) We are either on God’s side or on the side of evil. The Lord God Almighty has the power to overcome evil but one of the things that is required of us is to remain faithful before God. Isaiah explains the reasons why God’s blessings were not coming upon Israel according to Isaiah 5 that is related to her faithfulness. Similarly, Scripture says if I be righteous, yet will I not lift up my head (Job 10:15). Why not? Because every man is a servant to You, and everything he owns belongs to his Master. Again Scripture says, Only do not two things unto me, then will I hide myself from You, withdraw Your hand far from me; and let not Your terror make me afraid (Job 13:20-21), and also says, Remember, I beseech You, that You have fashioned me as clay; and wilt You bring me into dust again? Have You not poured me out as milk, and curdled me like cheese? You have clothed me with skin and flesh, and knit me together with bones and sinews. You have granted me life and favor, and Your providence have preserved my spirit (Job 10:9-12). And withal, will You summon me to stand for judgment? Why? Since man that is born of a woman is of few days, and full of trouble. He comes forth like a flower, and withers; he flees also as a shadow, and continues not. And do You open Your eyes upon such a one, and bring me into judgment with You (Job 14:1-3). As Solomon said, Who can say, I have made my heart clean, I am pure from sin (Mishley / Proverbs 20:9). On the day of judgment no man can declare himself pure, because There is no man that sins not (1 Kings 8:46), and because There is not a righteous man upon the earth, that does good, and sins not (Ecclesiastes 7:20). Here the midrash speaks of the Lord God in heaven owning all things, even our own lives and each breath that we take. The rabbis describe man as having been fashioned as clay, poured out as milk and curdled like cheese, being clothed with skin and flesh and knit together, and then been given mercy so to preserve man’s spirit. Note how each of these things are the work of God (clay, cheese, clothing, being knit, etc). The point is “As Solomon said, Who can say, I have made my heart clean, I am pure from sin (Mishley / Proverbs 20:9). On the day of judgment no man can declare himself pure, because There is no man that sins not (1 Kings 8:46), and because There is not a righteous man upon the earth, that does good, and sins not (Ecclesiastes 7:20).” This is similar to what Paul is explaining to the Romans in Romans 3:10-18. Paul wrote, “For all have sinned and fall short of the glory of God.” Every one of us has spurned the Lord God our Father in heaven. To say we have not is to take pride in oneself (which is a sin). Paul wrote in Romans 2:10, “It is written: none is righteous, no, not one; no one understands; no one seeks for God.” This is the same as what the midrash is teaching us. The Lord is all powerful, He is the creator, to Him belongs all things, even down to who we are, how we have been fashioned. No man can boast as to his right to be given eternal life. All of this is a gift of God in His mercy towards us. In Romans 6:23 Paul also said, “For the wages of sin is death, but the gift of God is eternal life in Christ Jesus our Lord.” We who believe in Him and what He has done on our behalf, the Lord credits as righteousness. The reason we come to Torah Observance is because we place our trust in Yeshua for our righteousness. God our Father has shown us in the Scriptures that He saves us by faith and our faithfulness is expressed in our obedience to His word. This should be the natural conclusion having read the Scriptures, however, modern theologies and doctrines have twisted the meaning of Scripture, the point of the Messiah Yeshua, and the empowering of God’s Spirit in the lives of His people. The Word of God teaches us the importance of living our lives by walking in His ways of righteousness, holiness, justice, and truth. Midrash Tehillim 143 Part 1 concludes saying, “In the sight of God, not even the stars are pure, for it is said, In Your sight no living thing will be justified (Tehillim / Psalms 143:2). What is meant by the words, no living thing? That in Your sight no thing alive will be justified and that only the dead will be adjudged pure? No, the words mean that on the day of judgment even the living things of heaven will be unable to justify themselves in Your sight. Hence, it is said, For in Your sight no living thing will be justified.” The midrash concludes saying that creatures both in heaven and on earth will be unable to justify themselves in the sight of God. These are the reasons why we must completely trust in the Lord God, His Messiah, and His Mercy. These are also the reasons why we seek to do God’s will each day (obey His instructions, Torah). ב כי רדף אויב נפשי וגו׳. וכן אמרו ישראל כשאנו מדוכים בצרות מה טוב לנו כבר דכדכונו ובחנונו, וכן הוא אומר כי בחנתנו אלהים צרפתנו כצרף כסף וגו׳ (תהלים סו י), לא תאמר כן אלו ואלו הן הרכבת אנוש לראשנו (שם שם תהלים ס״ו יב), ואחר כל אלו למשפט. אמר להם הקב״ה כל כך עבר עליכם, אלא מעתה אל תיראו, שנאמר וענתך לא אענך עוד (נחום א יב). 2. Verily, the enemy has persecuted my soul; he has smitten my life down to the ground (Tehillim / Psalms 143:3). Israel said this, How goodly a thing it is for us that we are smitten by persecution, that our enemies have already smitten us and tried us. As Scripture says, You, O God, have proved us; You have tried us, as silver is tried (Tehillim / Psalms 66:10). There is no need to recite to You the record of persecutions, for behold, it was You who have caused men to ride over our heads (Tehillim / Psalms 66:12). And after we have endured so much, will You bring us to judgment? The Holy One blessed be He, replied Because so much has passed over you, fear you no more, it is said I have afflicted you, O will afflict you no more (Nahum 1:12). It is interesting how the rabbis describe David’s persecution of the enemy smiting the soul to the ground. They say how good it is to us (מה טוב לנו) to be smitten by persecution. What is good about persecution? When persecution occurs the Word of God goes forth into the world. In the first century, the believers were persecuted in Jerusalem and they took the message about God’s Messiah out into the Roman Empire (Samaria, regions of Judea, Asia-Minor, and beyond). We also receive a blessing. Yeshua said “blessed are those who are persecuted for righteousness’ sake for theirs is the kingdom of heaven” (Matthew 5:10). The blessing comes by doing what is right, and being pleasing unto the Lord God Almighty. In 1 Peter 2:19 Peter calls suffering unjustly “this is a gracious thing, when, mindful of God, one endures sorrows while suffering unjustly.” He also said “even if you should suffer for righteousness’ sake, you will be blessed. Have no fear of them nor be troubled.” (1 Peter 3:14) What is this blessing of God that comes in suffering? Is it related to the testimony we have of God’s faithfulness in the midst of our troubles? Or having a testimony to give when asked or to speak of Yeshua the Messiah and his suffering? Can this be seen in light of the joy of being God’s servant? When suffering for our own sins, this is not suffering unjustly, but when we do so while doing what God commands, that is suffering unjustly and our Father in heaven is mindful of it. The rabbis refer to Scripture saying, “As Scripture says, You, O God, have proved us; You have tried us, as silver is tried (Tehillim / Psalms 66:10). There is no need to recite to You the record of persecutions, for behold, it was You who have caused men to ride over our heads (Tehillim / Psalms 66:12).” The rabbis say persecutions have the result of refining us as silver or gold. The credit goes to the Lord God in heaven having caused persecutions to come for the purpose of our testimony before men. When we are persecuted we share our faith. This is the blessing of having the opportunity to speak of the goodness of God! When we share our faith however, sometimes we are rejected. Some men even are antagonistic or insulting about our faith. Yeshua said, “when others revile you and persecute you and utter all kinds of evil against you falsely on my account” (Matthew 5:11) and, “Rejoice and be glad, for your reward is great in heaven, for so they persecuted the prophets who were before you.” (Matthew 5:12) The prophets of old were killed for their firm stand for the Lord God and His Word. Midrash Tehillim 143 Part 2 concludes saying, “And after we have endured so much, will You bring us to judgment? The Holy One blessed be He, replied Because so much has passed over you, fear you no more, it is said I have afflicted you, O will afflict you no more (Nahum 1:12).” We are told in the Scriptures the Lord afflicts us. Today we do not hear this message of blessing in persecution and trials. We only hear of only being blessed. This midrash is explaining to us that a blessing may also come to us by persecutions from the enemy. Our faithfulness and remaining faithful is a testimony of the Lord God working in our lives even in the midst of persecutions. This kind of interpretation is more consistent with what we find in the Torah and all of Scripture. The Lord God has all things in his control. These are the reasons why we are to seek the Lord God each day, to walk in His ways, and to lean upon His Mercy and forgiveness. It is only then, when we realize that remaining in His Word and in His Messiah Yeshua that we find peace in our hearts. Let’s Pray! Previous articleBits of Torah Truths, פרשת קרח, Parashat Korach, Hearing and understanding the Truth, a How to?